This Millionaire-Maker Stock Just Grew Its Earnings by 11.4%. Is It Time to Buy? The returns this company has produced over the years may surprise you -- and they continue to grow. Leading self-storage real estate investment trust Public Storage (NYSE:PSA) may not seem like the most exciting stock to you, and that's understandable. After all, what business is less interesting than warehouse-like buildings where people lock up their extra stuff? However, the returns generated by this self-storage giant have been anything but boring over the past several decades. And after a 14% drop in the share price over the past year, now might be a great time to add it to your portfolio. At first it may seem odd to refer to Public Storage as a "millionaire maker" stock. Typically, that title and similar ones are used in connection with stocks that have doubled, tripled, or more in short periods of time, which Public Storage is more of a slow and steady type of growth story. However, when you take a look at the company's track record of performance, the millionaire-maker label makes a lot of sense. 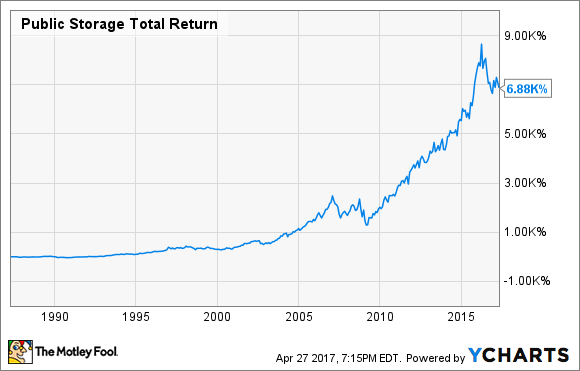 As you can see in the chart below, the stock has produced a remarkable 6,880% total return over the past three decades (15.2% annualized) -- roughly six times the S&P 500's return over the same time period. PSA Total Return Price data by YCharts. To put this level of performance into perspective, consider that every $14,325 invested in Public Storage 30 years ago would be worth $1 million today. Who says "boring" businesses can't make you rich? Most people are at least familiar with Public Storage from a consumer's point of view. As the clear leader in the self-storage industry, Public Storage's recognizable orange storage buildings are all over the U.S. At the end of the first quarter, the company owned 2,354 storage facilities in 38 states and over 200 more in Europe, with a total of about 155 million rentable square feet of space. It is the dominant self-storage operator in several high-growth markets, including Los Angeles, San Francisco, Portland, and Seattle. By nature, the self-storage business is attractive from a cost perspective. Specifically, self-storage buildings tend to have lower operating expenses and turnover costs than other types of real estate. In fact, Public Storage has previously said that its facilities only need about 30% occupancy to break even, and they are currently more than 90% full. Public Storage's leading market share gives it cost and efficiency advantages over competitors, and its strong, well-recognized brand name gives it higher pricing power. The company's goal is to sustainably grow its business, while maintaining a rock-solid balance sheet. The company has historically avoided taking on any debt at all, but has modified that strategy over in recent years, as interest rates fell to historic lows and became too attractive to ignore. Public Storage grows through acquisitions, but in recent years has started to develop new facilities from the ground up, which can provide a boost to shareholder value. Think of it this way: If it costs Public Storage $10 million to acquire a storage facility of a certain size but only $8 million to build it, not only does this create $2 million in instant value but it also results in a greater return on invested capital. Of course, this is a simplified example, but in the real world, developments have the potential to create significant value for investors. In fact, the company estimates that developments produce ROIC that are 2%-3% higher than acquisitions. The company's results prove that the business model is successful. Over the past 10 years, Public Storage has produced annualized 10% free cash flow growth and 9% core FFO growth. Shareholders have been rewarded with dividends that have grown by an average of 14% per year. To be fair, Public Storage's first-quarter earnings report wasn't exactly stellar, which is why the stock dropped 4% in reaction to the quarterly results. The company's funds from operations (FFO) -- the REIT version of earnings -- missed estimates by $0.05, and same-store occupancy declined by 0.5% year over year. Even so, most of the recent data still looks strong from a long-term investment perspective. Although it missed estimates, the first-quarter FFO represented a 11.4% increase over last year. And same-store revenue grew faster than expenses, despite the decreased occupancy rate, which was still an incredibly strong 93.1%. No stock capable of the returns Public Storage has generated over the years is without risk, so it's important to be aware of these before jumping in. One big risk factor that all REITs face is interest rate risk. Without going into a long explanation, rising interest rates are generally bad for high-dividend stocks, such as REITs like Public Storage. Interest rates are expected to rise gradually over the next few years, and I believe that the current expectations are priced into the stock (one reason why it's down over the past year). However, be aware that if rates rise faster than expected, the stock could certainly drop. Also, note that the self-storage business is not a defensive type of real estate. In other words, it tends to do very well when the economy is strong, but also tends to suffer in tough times. Not only is self-storage a somewhat discretionary purchase -- in tough times, people are more inclined to "find room" for their extra stuff somewhere else -- but self-storage facilities generally lease their space on a month-to-month basis, making it easy for cash-strapped tenants to vacate. Public Storage has high occupancy now, but it could certainly take a hit in a recession. While it isn't without risk, Public Storage has a fantastic track record of responsibly growing its business and delivering excellent returns in a variety of economic climates. The stock's performance has taken a breather -- down 14% over the past year -- so now may be a good time to consider Public Storage for your long-term portfolio.